Pro Vocal Men's Edition Volume 15. By Queen. Pro Vocal. Rock. Softcover with CD. 40 pages. Published by Hal Leonard (HL.740453). ISBN 1458494373. 9x12 inches. Book/CD Pack. Whether you're a karaoke singer or preparing for an audition, the Pro Vocal series is for you. The book contains the lyrics, melody, and chord symbols for eight hit songs. The CD contains demos for listening and separate backing tracks so you can sing along. The CD is playable on any CD, but it is also enhanced for PC and Mac computer users so you can adjust the recording to any pitch without changing the tempo! Perfect for home rehearsal, parties, auditions, corporate events, and gigs without a backup band. 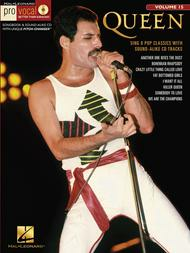 This volume includes 8 classics: Another One Bites the Dust • Bohemian Rhapsody • Crazy Little Thing Called Love • Fat Bottomed Girls • I Want It All • Killer Queen • Somebody to Love • We Are the Champions.